Amazingly, it didn't crash my Netscape, either. Goodness, I'm glad I did this from a machine running Unix, so it didn't try to download the 2 megabyte WAV file of the FY opening theme. What's this? There's no actual <title> tag, and no text header on the page, just an image with no 'alt' element. Hmmm. 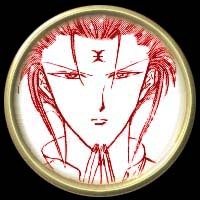 Well, looking at the source (betcha didn't know that Suzaku knew HTML, now did you? ), I also see text/background colors set with color names instead of hex codes, something which will definitely NOT work in every browser, I see a <bold> tag which does not work at all, I see that the author somehow got the idea that the <html> tag (which should appear only twice on a web page -- as the very first line and the matching </html> as the very last line) was the right one to exclose a paragraph in... ^^;; And it gets worse. I see missing "s and >s, I see totally misconstructed anchor tags, I see signs that the author obviously doesn't know enough HTML to proofread the code on her page. I see <a href="somepage.html"</a>Some Page</a> so often that I have to believe that the person who wrote this page thinks that's the correct HTML syntax. I see direct links to images on other sites (bandwidth theft), and the crowning glory, really, I see web ring code that still contains all of the YOUR NAME HERE, YOUR EMAIL ADDRESS HERE, and YOUR SITE ID HERE from the example -- it hasn't been altered in the slightest. I'll note that at least our author, Taila (whose email address is not that easy to notice, with no actual mailto: link.. I wonder if this was deliberate), at least has advocated buying the commercial release of FY from Pioneer, which is a good thing... however, I'd be more impressed with that show of morality if she weren't stealing left and right from others' web pages, both their hard work in the form of direct copying of HTML code and snatching of images, and also in some cases possibly their money, in the form of adding bandwidth to sites such as genesis.simplenet.com, which may face hundreds of dollars per month in extra charges due to simplenet's recent pricing changes -- without even getting the benefit of more visitors to their web page -- if people like this Taila continue to steal their bandwidth by linking directly to images from their site. This web page was actually recommended to me by more than one person, disappointingly enough. I can see why, since it does have some pretty good character information, and a comprehensive guide to the CDs -- however, it's clear to anyone who's been around the FY web that most of her information, with the exception of the personal opinions on some of the character pages, came from other sites, in some cases CUT AND PASTE or very close to it. Looking at the source code to the pages shows not only a staggering lack of knowledge of anything resembling correct HTML (except on the 'remaining character' page, where the HTML suddenly got much better -- oh, wait, that's totally cut and pasted from EX Magazine! ), but also a large number of direct links to others' pages for images, sounds, etc. It's also got the worst choice in background images that I've seen since 1995 or so (when they were first introduced). They're HUGE in file size, text looks horrid on them, and they are just generally terrible web page backgrounds, even though many are nice (stolen and directly linked) images. The author actually has managed, since the first time I saw the page, to include SOME credit to Genesis, very very briefly, on one of the image gallery pages... but other places still claim that she made some of the images and found the rest. Yeah, you bet she found them, she found ALL of them on Genesis's site, or amber.mcs.kent.edu, and they're all still directly linked. The music page also got a really lame note, but files are still directly linked, and oddly enough none of the huge WAV and MP3 files that she uses for background sounds all over the site are linked to on the sounds page, where they would be more useful. Overall, this page is a staggering example of how people with probably good intentions can make the web a very ugly place, both visually with the horrid clash of background vs. text and the terrible HTML, and morally with the rampant use of images others spent time and money to create, and with the theft of bandwidth from those who actually pay for their web space. If this page didn't leave such a bad taste in my mouth, I'd definitely have to consume it. SHAPE UP!